When I think of summer, one of the first things that comes to mind is watermelon. How awesome is a fresh slice of watermelon, right? It reminds me of being a kid again. I have already done a watermelon punch , so why not do some popsicles too! These watermelon mint popsicle are perfect for a refreshing treat on a hot summer day. And who doesn’t like a good watermelon popsicle recipe? My kids are loving these popsicle molds by Tovolo. One of the things I like best about the molds, is the drip catch. Perfect for my kids, who tend to eat these slowly. Do you have them too? If not, you should get some. 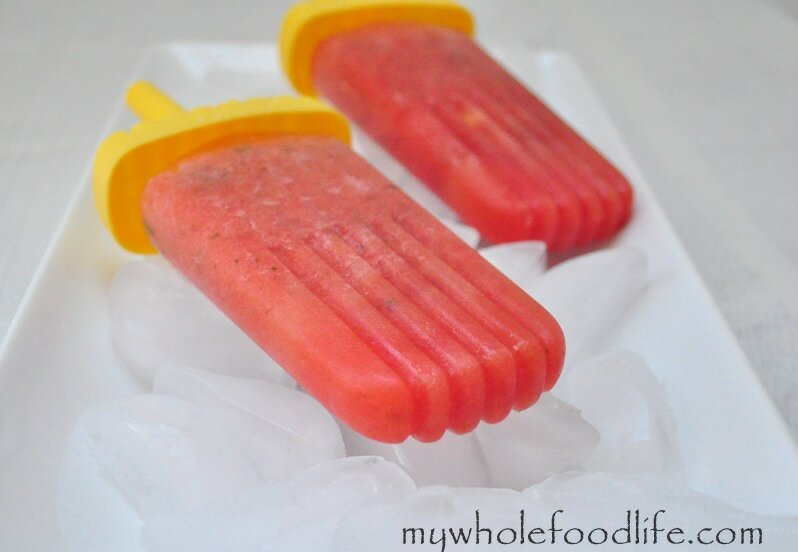 Watermelon Mint Popsicles and a Giveaway! Blend both ingredients in a blender for about 90 seconds. Pour into popsicle molds . They should be ready to eat in about 4 hours. Enjoy! Liked both...my comment...I so look forward to your recipes. I just started gluten free and am starting to lose a bit of weight! Yay! Thanks so much! I LOVE popsicles! I hope I win! I would love to win these for my toddler to try! Thanks so much for such great simple recipes. I take care of my dad who is 85 and has dementia. It is tough to get him to drink enough so we fight dehydration with homemade popsicles. Your recipes are great!